Have you been sleeping with the enemy too long? We all know that dust mites love to wreak havoc in your bedding sheets which can cause you countless problems. They don’t just love to stay in your bed, they also love to inhabit your home and you can even inhale them! The dust mites themselves aren’t the problem, it’s actually the harmful allergen which they create and this comes from their faecal pellets and body-part fragments. The shocking and scary truth is that dust mites are nearly everywhere; nearly all homes in the UK have detectable levels of dust mite allergens. Are you scared yet that these irritating and harmful little critters are infecting your home? The worst part is your allergies are actually produced from their faeces! So it’s breathing in their faeces which causes you to have the associated problems! Nasty! All is not lost because there is help out there in the form of the Good Ideas Dust Mite Repeller. How does the plug-in dust mite repeller work? Scientific studies have demonstrated that specific levels of ultrasound over and over a given period of time interfere with the feeding and reproductive cycles of the common dust mite. This significantly reduces the population of mites and their allergens which can cause asthma and sneezing. It couldn’t be easier to use, using this ultrasound dust mite plug-in is the safest way to reduce dust mites and the allergies they create! All you need to do to use your dust mite repeller is simply plug it into any 240v socket in an unobstructed position near your bed, chair or sofa. What are you waiting for? 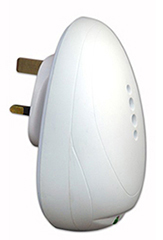 Improve your allergies with this easy to use, dust mite plug in by Good Ideas. Allergy sufferers and those wanting to reduce the problems and symptoms associated with dust mites. Repels dust mites using ultrasound, unit can safely be left to run for 24 hours and covers an area of approximately 80m³ No harmful chemicals are used.